This contest wasn't on the radar. A Democrat isn't supposed to be in the running in this conservative stronghold. But Linda Coleman is giving the GOP fits. 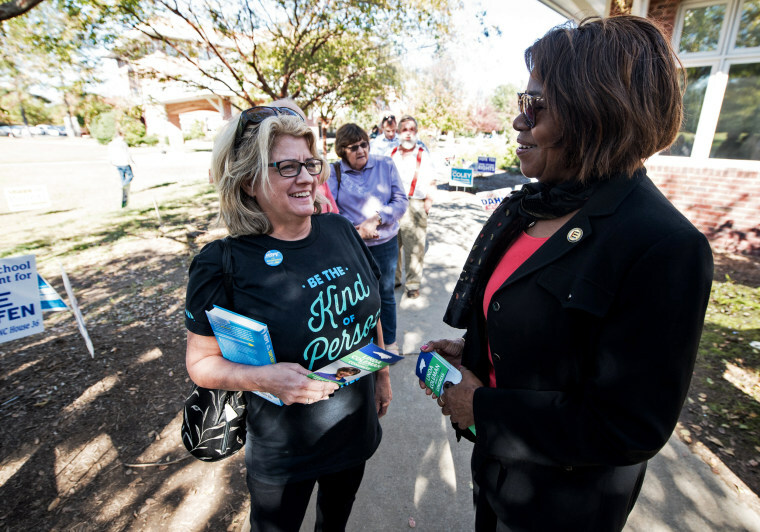 APEX, N.C. — The top of the blue wave approached a friendly suburban town on a beautiful afternoon as Democratic candidate Linda Coleman, 69, campaigned for Congress last week at a community college by a row of fresh pastel townhouses. "I hope you'll vote for me, Linda Coleman," she said to voter after voter in a melodious drawl as they lined up at an early voting site. If they stopped to talk, Coleman, a former state legislator, county commissioner and two-time nominee for lieutenant governor, would keep her pitch tight: "Health care, education, jobs" is her motto. She deliberately avoids bringing up President Donald Trump, who she said was a "non-factor." Nearby signs for her opponent, three-term GOP Rep. George Holding, simply read "conservative." Chances are high you haven't heard much about this race. Neither of the candidates is a charismatic viral sensation or a fiery ideologue raising huge cash from small donors. Coleman is an experienced politician, but she is more excited to talk about her career overseeing human resources at state agencies. Holding is a self-described "boring tax lawyer" and former federal prosecutor with a passion for fiscal policy. When they debated last week, the local newspaper's headline was about how mild-mannered each was. Holding even defended Coleman from an outside group's attack ad. "The fact that he's a generic Republican is probably what stands out about him," Jonathan Kappler, a political analyst for state businesses at the North Carolina Free Enterprise Foundation, told NBC News. "When she was the Democratic candidate for lieutenant governor in 2012 and 2016, she kind of performed like a generic Democrat." In other words, it's an utterly unremarkable race — which makes it a fascinating test of the 2018 Democratic wave. That's because, in this district, the "generic Democrat" facing the "generic Republican" shouldn't be able to win this seat. North Carolina's 2nd Congressional District was drawn by Republican lawmakers in one of the most notoriously gerrymandered states to favor their side in good times and bad. The lines changed in 2016 after courts ruled that they had discriminated against black voters, but Trump still won the district by almost 10 points, and Holding won by more than 13 points. Yet, somehow, despite lacking any of the excitement or intrigue of other races, it's become a premier contest, albeit a quiet one. Outside groups on both sides, including the Congressional Leadership Fund, the Democratic Congressional Campaign Committee and Women Vote, have poured in over $3 million to influence the outcome, according to OpenSecrets, the database of political contributions maintained by the nonprofit Center for Responsive Politics. This is what can happen in a potential wave: Seats that aren't on anyone's radar suddenly become a race. In addition to this district, Republican-allied groups have thrown late cash into seats like Georgia's 6th, South Carolina's 1st and Michigan's 6th, all of which were once expected to be safe. The Democratic map has expanded to encompass about 100 plausible targets, easily the most for either party since the 2010 Republican tsunami. But if the map is wide, it's also shallow. There are few seats Democrats have clearly put away and lots of seats like Holding's where they have an outside shot at victory if the wave is big enough. If the national vote breaks from current polls by just two or three points in either direction, dozens of seats could break with it. "We're a really good weather vane for how good a night the Democrats will have nationally," said former Democratic strategist Mac McCorkle, a public policy professor at Duke University. As is the case for many Democrats, Coleman's path to victory runs through upscale suburbs like Apex, a booming community near Raleigh that was named the nicest place to live in America by Money Magazine three years ago. It's towns like this where voters, especially women, have turned the strongest against Republicans in recent elections. Political observers say the area has also seen a flood of newcomers from blue states, which may make the race more competitive this year. Terry Kaufman, 61, said she and her husband, both "born and bred Democrats" who are voting for Coleman, arrived recently from California. "We moved here sight unseen," Kaufman said. "My husband just went online and decided the Raleigh area was the place to live." But there's still a strong local split between liberals and conservatives, and several voters said they were reluctant to bring up politics for fear of offending co-workers and neighbors. "The Democrats, not so much at the state level but nationally, are ludicrous," said Michael Meade, 74. "I don't want to live in a socialist country." Even in a potentially tough cycle for Republicans, Holding was considered safe compared to two other GOP-held seats, in the 9th and 13th districts. But Holding announced to his supporters in late August that he was losing in an internal poll. Coleman said her own polls showed a similar race, and a public survey sponsored by the Civitas Institute, a conservative group based in the state, soon found Holding down by 1, as well. That prompted alarm bells from Republicans, who worried that Holding hadn't taken the race seriously enough. "The old saying goes, you run two ways: scared or unopposed," Civitas President Donald Bryson said. "Holding wasn't running scared, and he wasn't running unopposed." Soon outside money was swooping in to fund attacks against both sides. The topics are similar to those in other races, which makes the district a good test of party messaging. Coleman and her allies are going after Holding for his votes to repeal President Barack Obama's Affordable Care Act and weaken its protections for pre-existing conditions and for not holding town halls. Holding and his supporters have attacked Coleman for supporting "sanctuary cities," where local authorities have a policy of not cooperating with immigration authorities in some circumstances, and for voting to raise taxes in the state Legislature. Coleman told NBC News that the immigration attacks were "fear-mongering," but they may have taken a toll. A new Civitas poll last week found Holding back up by 9 points despite trailing the previous month. Both sides have made some nods to moderates. Holding said in the last debate that he disagreed with Trump's divisive rhetoric. "I wish some of these early morning tweets wouldn't happen, but when it comes to the issues we've actually gotten across the finish line, I do agree with what we've been able to do," he said. Holding also condemned a misleading Congressional Leadership Fund ad last month that called Coleman's tax payments "shady" and said he had used a similar approach with his own taxes. He said the commercial was "a good example of broken politics." Coleman hasn't signed on to Democratic proposals for single-payer health care and said she wants to focus on bipartisan negotiations, instead, because "I don’t think that any one group will have all the answers." As Coleman elaborated on her positions from a bench outside the polling site, Garcia, the Republican-leaning voter who had been torn between candidates, stopped by to say that she had made up her mind, but she wanted to keep her vote secret. That was encouraging enough for Coleman, who said she has received surprising interest from Republican and independent voters who might not have considered her in previous elections. "This is a very strange year," she said.